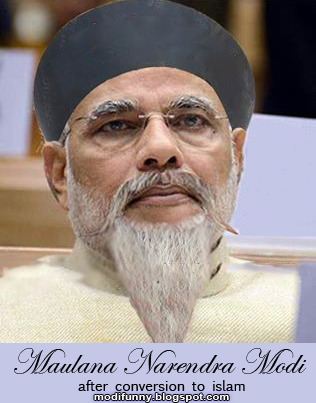 This photo was probably taken by a Muslim fan of Modi showing him as Maulana Narendra Modi. This picture is subtitled as 'After conversion to Islam'. The Humor behind it is obvious. Disclaimer: We have not made this or ANY image. We have only collected them from social media.